Cycling and Walking Holidays in South of France. 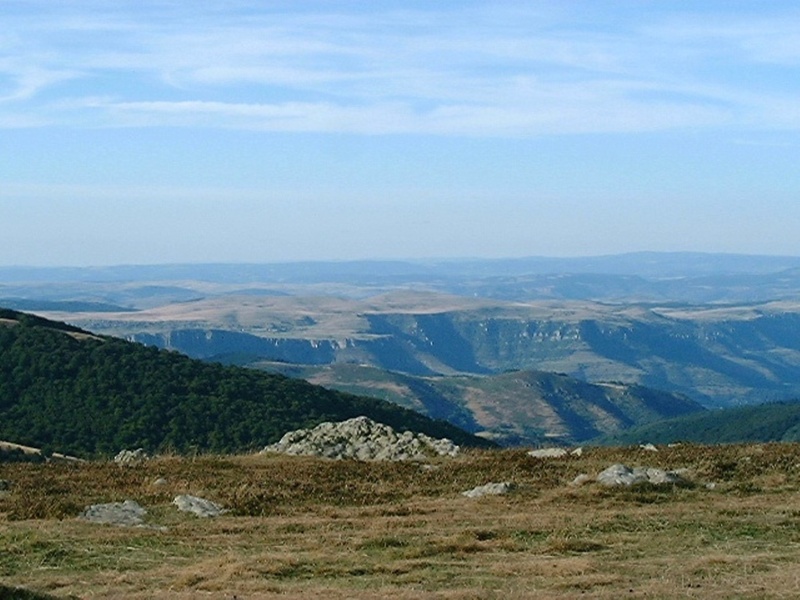 Massif Central: Parc des Grands Causses (Gorges du Tarn), Auvergne and Aubrac. for all info on cycling or walking tours in the region of your choice. Selfguided cycling or walking holiday trips with bags transfer. On the spot support when needed. Tailored and standard cycling & walking vacation tours. Small typical country hotels or guesthouses with character and charm. From ** and *** family run hotels to *** and **** luxury hotels. Rooms with shower and bathroom en-suite in all packages. Flexibility: Choice of accommodation, length and level of trip. Accommodation options: budget, standard, plus, superior and luxury. Very attractive discount for parties of 3 persons and more. Mailinglist La Ligne Verte: Enter your email address here. La Ligne Verte - VALAC is a Dutch tour operator specialized in active travel. 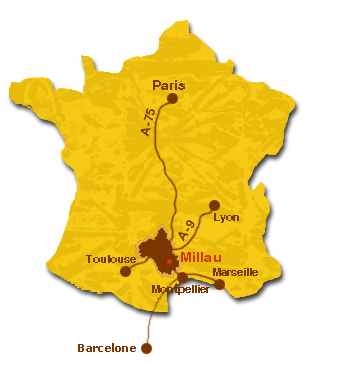 Valac organizes walking holidays and cycling holidays in South of France. We're on the spot all year and work exclusively in the South of France, which by now we have come to know very well. We built a network since 1995 so whatever mighty happen, we'll be on the sport ourselves or find you the assistance needed. You can phone till late in the evening for any problem you might encounter. Frans Bevort, our contactperson in South of France was from 2009 to 2012 chairman of the local "Syndicat d'Initiative des Raspes ", the Tourist Office of the Canton of St.Rome-de-Tarn, serving the tourist interests of 9 villages along the Valley of the Tarn, promoting tourism in this beautiful part of France. As locals, we know every site, every back-road, all the local professionals working in tourism. As locals we can make any personalized and customized tour. We will help you to discover wonderful remote places and savor the essence of the hidden treasures and the highly preserved local cultures. Tours are really splendid and guarantee an unique experience. Years of cooperation with local suppliers, hotel keepers, taxi drivers, local Offices de Tourisme (Comité Départemental de Tourisme (CDT) de l'Aveyron) and designers and maintenance workers of walking trails, resulted in our Southern France network. As direct seller and E-touroperator we can quote competitive rates and still have an outstanding personalized service. Especially for singles, the rates of La Ligne Verte are most reasonable, whilst for small parties (families, 2 or more couples) of 3 and more persons we have rather attractive small group discounts. We don't have brochures to send to you and no extensive back-offices, but we are here, all year to give the assistance -when needed- our selves. We communicate mainly by this website and by email, but we can also skype, phone or fax you, if you prefer. If you need more info than this website provides or if you want tailored information we will send it to you by email. A virtual visit of Aveyron Grands Causses. Just go to our testimonial page, they tell you about us! See this recommendation at tripadvisor. Online booking and payment by a "pay-per-link" posssible with VISA, Mastercards and American Express. If you've never been in Europe before you might need the assurance of assistance. We and our partners are on the site all year! We speak French, English and Dutch. With our roots in a small village along the Tarn we came back from Northern Europe to live the countryside life of the South again. We want you to experience the quality of life this part of France has to offer: a beautiful environment, nice and relaxed people, culture and ancient history and according to a recent French survey, in l'Expresse, every year again, one of the best departments of France to live in especially for seniors. Valac, vacances à la carte, is the planning and booking office of La Ligne Verte. We help you planning and booking the right trip. Our packages start the first day ("day 1") with dinner or, in case of a B&B hotel, with checking in your hotel room for the night. Our packages end the last day after breakfast. So neither the first nor the last day are effective walking or cycling days. Of course the first day you can do a small walking tour and try out the bikes if you rented some and arrived early enough. So a 7 days package will include 6 overnights and 5 walking or cycling stages. Service starts at the choice of a trip: length, degree of difficulty, kind of scenery and other preferences you may have: we will advise you in choosing the right tour for you. Besides that, the quality of your holiday is also the service you'll get in the hotels, the food, the transfers of your luggage, support when needed, the most interesting roads and trails, up to date hiking and cycling maps and route descriptions to make your holiday a carefree enjoyment all the way. See our booking page for all details and booking procedures. Click here. 5 to 15-days (or more) independent, individual biking- or hiking trips with luggage transport and overnights in old typical hotels and Chambre d'Hotes with charm and character. (generally) Halfboard basis (dinner+B&B: demi pension). Tours are offered in 5 accommodation classes: budget, standard, plus, superior and luxury. Shower and WC en suite in all classes. Price (basic rate) of an 7 days package include 6 nights B&B, some to all dinners, all luggage transfers, roadmaps, written instructions, assistance when in trouble included. Basic rates implies double occupancy in double rooms. Supplements for single occupancy and for twin (2 beds) occupancy. Some times high season supplements and low season discounts apply. Standard packages are packages with ** hotel accommodations (often Logis de France and owner runned hotels) with shower and bath en suite. Sometimes in the best of family hotels we have come to know over the years (no chain hotels!). Quality of these owner run hotels in Aveyron is more than can be expressed in the official number of stars which in this year are going to be updated! Plus packages have one or more nights in *** hotels and exceptionally in guesthouses ("Gites de charme" with a pool). Apart from being a local provider of walking and cycling tours in Grands Causses, Dordogne and Provence we also have partners in Corsica and Nice and we organize walks in the Cathar Pyrenees ourselves. See our walking and cycling pages. The pools in our hotels don't come with gyms and other stuff, none of which our clients ever use. 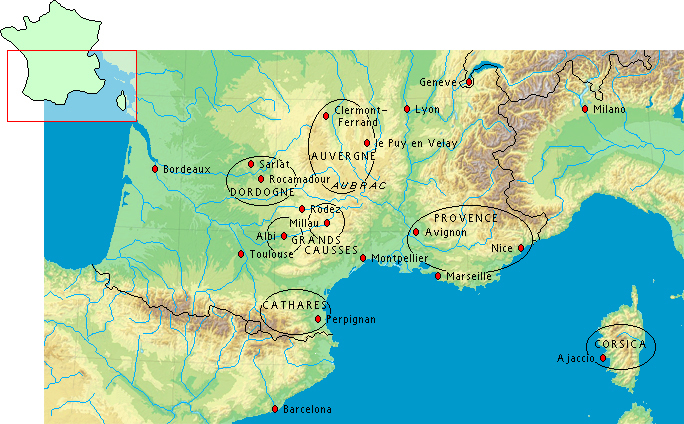 Starters: One or two extra nights in the first hotel of your tour or in Avignon, Nice, Toulouse, Millau, Rodez or Albi. La Ligne Verte / Vacances à la Carte does not accept any liability for any loss or injury however caused. We recommend that you take out appropriate holiday insurance covering you against illness, injury, and loss or damage to luggage. This insurance should also cover the possibility of your having to cancel your holiday for whatever reason. Hotel Hiking and Biking Holidays. La Ligne Verte: Dutch organization, the French way of life, Europe at best.